I have a quick project I want to share with you and it’s actually from inside my house. Have you ever had that moment when you finish a task or project and you think…I should have done that way sooner? That’s exactly how I felt after giving my en suite bathroom a much-needed update. 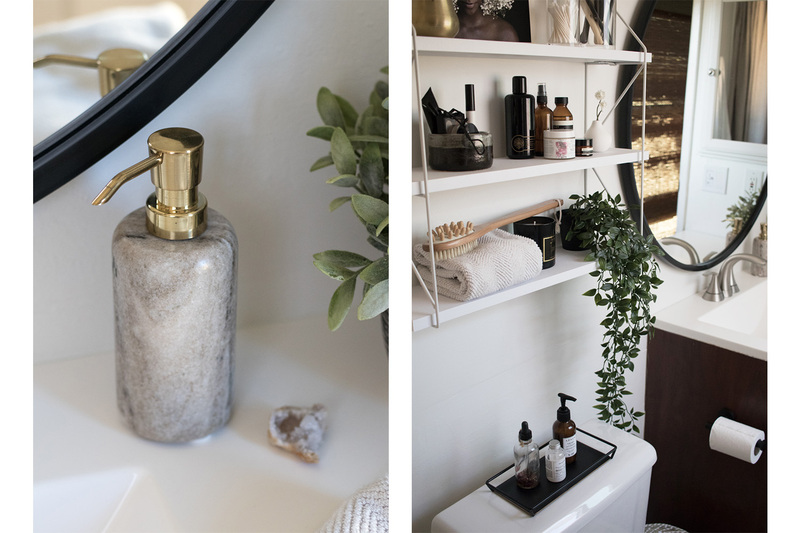 It is the teeny tiniest of spaces and I wouldn’t describe it as a master bath as there is nothing master about it. The space is so cozy, my husband and I have separate bathrooms. Him using the hall/guest bath which is not much larger and me using the one attached to our room. It’s best for our marriage. When we moved into our home 6 years ago my bathroom wasn’t the area that needed the most attention. I had it in my mind that I didn’t want to “waste” money and materials to shine it up if I was just going to redo it someday. So neglected it went and someday became years. The other bathroom got remodeled, then the kitchen and so on. 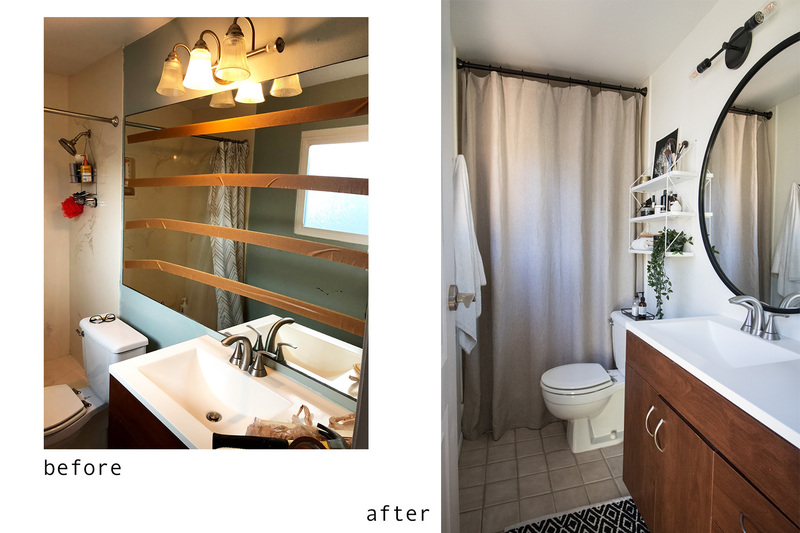 I have designed it a million times in my head and even have gotten quotes to give it a gut remodel but for a 30 square foot space every penny just felt like too much to spend when we had higher priority projects to tackle. As time went on and especially as I have been more aware how much the space I live in effects my mood I decided it was finally time to give it some love and a fresh coat of paint. 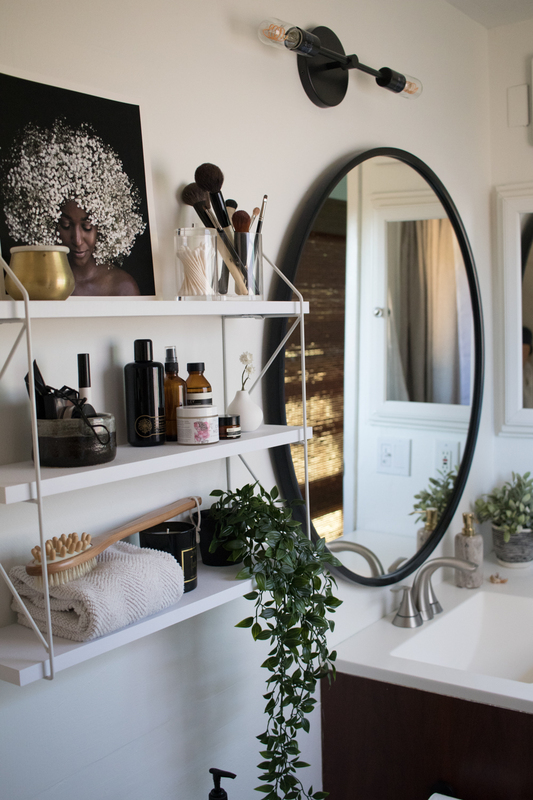 My goal for the space was just to make it feel cleaner, brighter, and more my style without spending a lot of money because as you know…that full renovation is still in my head. I’m holding out for the tadelakt plaster bathroom of my dreams. 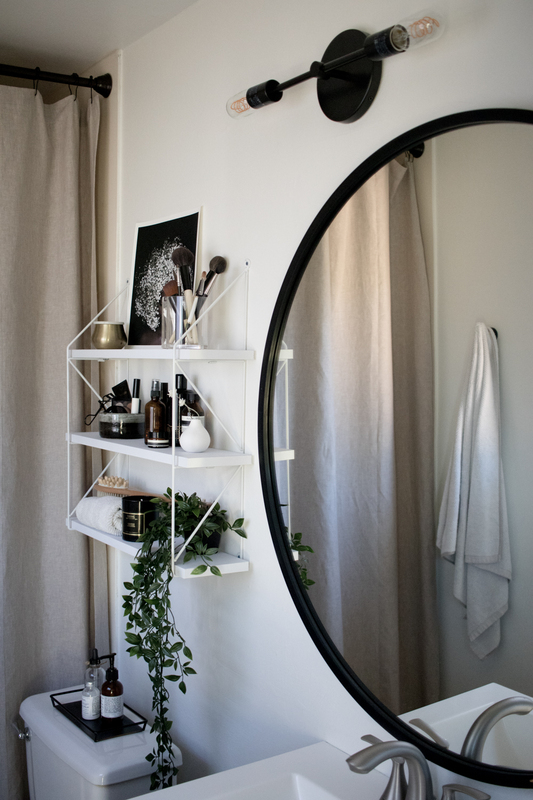 So over the course of a weekend and trailing into the week we were able to remove the basic builder mirror in one piece thanks to this Youtube video and gave the space a fresh coat of Benjamin Moore Cloud White in Eggshell that we had on hand. I took the mirror from our entry to replace over the existing vanity and it fits perfectly. 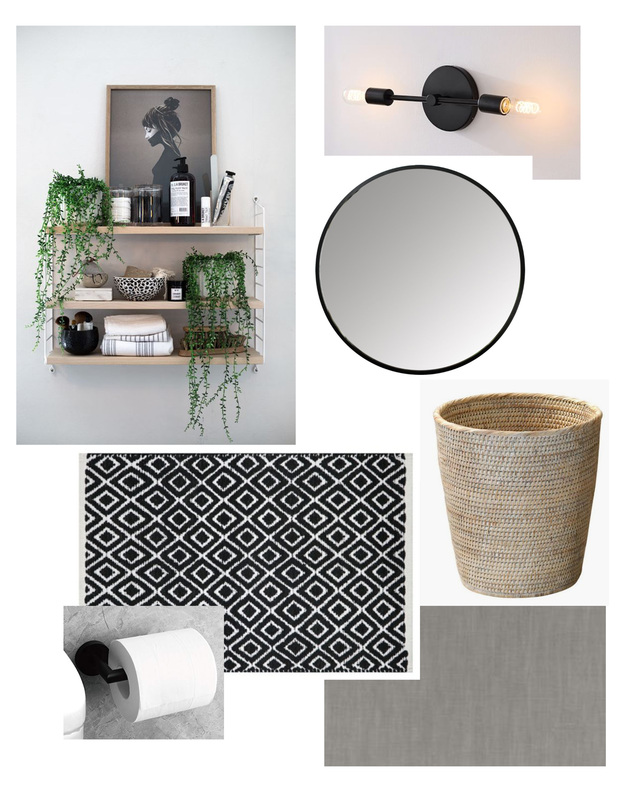 With some online shopping, I ordered a simple light from West Elm, a shelf from Wayfair, an extra long linen shower curtain, and black hardware from Amazon. Lastly, a Target run pulled all the linens and final touches together. I love how the space feels now. I’m beyond happy the blue walls and blah mirror are gone. It feels so much brighter and cleaner. The fluffy white towels and linen shower curtain add a little bit of luxury to the space that otherwise lacks it. 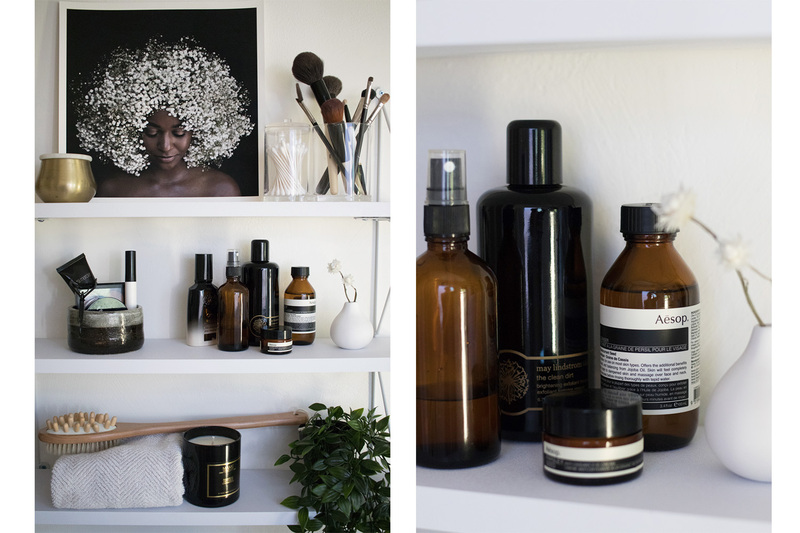 The black modernizes it enough and I can’t believe how happy that shelf makes me. I’m a skincare nut and seeing all the pretty bottles brings me so much joy. Do you want to know what made me even happier than that shelf though? A dimmer! Such a simple thing to install but it is so nice to brush my teeth in soothing dim light before bed. So, I learned the finished project far exceeded my expectations. That holding out for the big project just to not waste things makes sense sometimes but for a couple hundred bucks, I’m pretty happy with this little ensuite refresh. Dare I say I’m not in a rush to remodel anytime soon. Do you have a space in your home that could use a simple update?